A record of the changes at Distant Junction and the Throat during the installation of the third track in 2009 and 2010. The work involved the installation of a third main between Distant Junction and A-Box as part of the Wellington Regional Rail Project (WRRP). 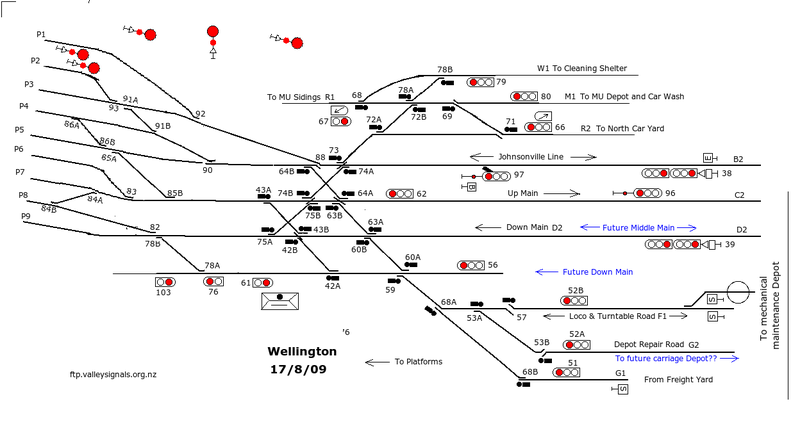 Note that Distant Junction is also known as Wellington Junction. 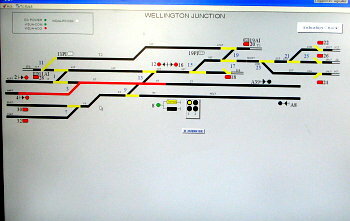 Distant Junction and the Throat are both under the control of A-box, although Train Control could log on and control the junction if necessary. I plan to expand his site to provide more information about A-Box, including photos. A computer game or the real thing? (November 2009). These diagrams show changes at the throat during the third track project. The next two diagrams are missing. Queens Birthday Weekend. June 2010. (See bulletin 371 3/6/10). Middle main brought into use. Down main out of service because interface with A-Box not completed. 4th/25th July. Final signalling work in A-Box to bring the new down main into use. 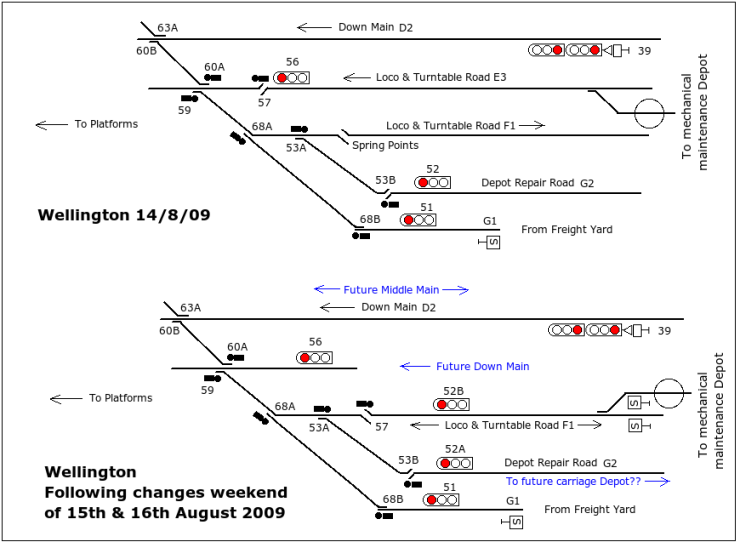 These diagrams show changes at Distant Junction during the third track project (and a few extras!). Signalling Down Trains in 2004. Signalling Up trains in 2001. 5th/6th September 2009. CBI commissioned at Distant Junction. Signals renumbered. November 21/22 2009 - Up intermediate signals 222 and 224 relocated 26m south. 26th December 2009 - 5th January 2010. Xmas/New Year Block of Line. Up main realigned. Easter 2010. BOL over weekend but no signalling or track changes. Queens Birthday Weekend. June 2010. (See bulletin 371 3/6/10). Physical work completed. Middle main brought into use. Down main out of service because interface with A-Box not completed. 24th/25th July Final signalling work in A-Box to bring the new down main into use. This is a list of S&I circulars issued during the third track project. I have not posted the S & I circulars on this site because of copyright and the size of the PDF files. 2924 (Draft only) August 2009 Changes to F1 and E3 roads. 2932 September 2009 CBI installed at Distant Junction. Signals renumbered. 2933 Xmas/New Year 2009/2010 BOL. Up main at Distant Junction realigned. 2941 Queens Birthday June 2010. The final arrangement, although some signals were fixed at stop and the Down Main did not come in use until July 2010. At the completion of the work described on this page Train Control could see the tracks from Ngauranga to the platforms. The Junction was controlled from a work station in A-Box but Train Control could log on and control the junction if need be. The platform area was still controlled by the A-Box signalman from the 1936 26L frame. In a separate project the crossovers at Ngauranga were removed and axle counters installed. Resetting the axle counters is done by Train Control. Thanks to Terence Delaney for supplying this information.